The Avimaia schweitzerae fossil. The egg fragments are too small to see with the naked eye. 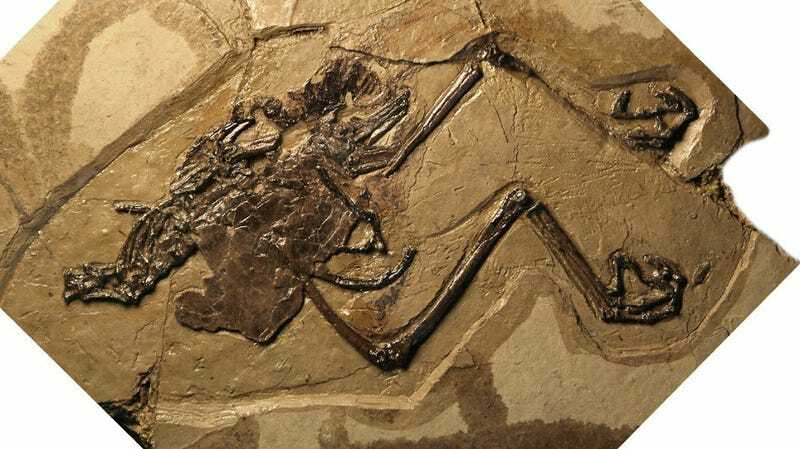 Paleontologists in China have detected traces of an unlaid egg in a 110-million-year-old bird fossil from the Cretaceous period, in what’s considered the first discovery of its kind. And in an ironic twist, it appears the egg is what killed the mother bird. Say hello to Avimaia schweitzerae, a newly described bird species from the Cretaceous. The fossil is remarkable in that is still contains traces of an unlaid egg and a medullary bone—a special type of bone tissue related to egg-laying. It’s the first time paleontologists have found those two elements together in a fossil, and the first time bits of egg shell have been discovered in such an ancient fossil. These findings were released today in a Nature Communications paper authored by Alida Bailleul and Jingmai O’Connor from the Institute of Vertebrate Paleontology and Paleoanthropology of the Chinese Academy of Sciences. As a species, Avimaia schweitzerae (meaning “mother bird” and a nod to paleontologist Mary Higby Schweitzer) may be new to science, but it belonged to a well-documented group of ancient birds known as Enantiornithes. This family of birds was quite successful, living over 100 million years ago alongside dinosaurs such as Tyrannosaurus and Triceratops. A neat thing about Enantiornithes is that they were born with flight feathers, which suggests they could fly very soon after hatching. Artist’s interpretation of Avimaia schweitzerae, including the dead mother in the water. The fossil, identified as IVPP V25371, was found in northwestern China, and it was very well preserved despite being crushed flat like a pancake. The partial skeleton consists of the bottom half of the spine, pelvis, hind limbs, and traces of feathers. The bits of eggshell, which came as a surprise to the paleontologists, were detected inside the bird’s abdomen following microscopic examination. Analysis of the fragments showed parts of the egg membrane and cuticle (the outermost protective layer of the shell), the latter of which was coated with proteins and other organic materials. Interestingly, the researchers also discovered evidence of small sphere-like minerals comprised of calcium phosphate. Similar minerals are found among birds who partially bury their eggs, suggesting Avimaia schweitzerae did the same—not a huge revelation, given that Enantiornithes are already suspected to have buried their eggs. The condition of the eggshell fragments, however, strongly suggest the bird’s reproductive system was not functioning properly. And in fact, the unlaid egg itself probably resulted in the death of this specimen, the authors argued. The shell was unusually thin and it featured two layers instead of one. Together, it suggests this bird suffered from egg-binding, an often fatal condition in which birds are unable to lay a developing egg. Analysis of the fossil also yielded traces of a unique reproductive tissue called the medullary bone, which acts as a calcium reservoir for the developing egg.